Sue Parsons is Research Analyst/Data Manager for NSF Reynolds Creek CZO and EPSCoR MILES projects. Her background is in ecology, geographic information systems (GIS), land use, and education. Sue provides data management, analytical, and training services to ISU and project affiliates. ​ In our changing world, science literacy is the foundation of a more sustainable future. Motivated by this, RuthMacNeille is a new Doctorate of Arts student pursuing her passion for biology and STEM education through work at the Reynold's Creek Critical Zone Observatory (CZO). Her work focuses on the spacial and temporal patterns of chemical-biological processes that characterize the land/water ecotone in ephemeral stream systems. As climate change threatens to increase extreme seasonality, Ruth believes understanding such systems is essential. As a Doctorate student, she is developing an educational program around these important concepts for the Reynold's Creek CZO that reaches a broad audience through the informal sector. Ruth received a BA in cultural anthropology and history from the University of Michigan (2008). 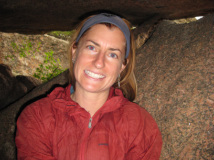 She brings years of field experience as an environmental educator, ecologist and park ranger. Ruth is excited to be joining the Lohse lab where she will develop her skills as a teacher and scientist in mountainous Pocatello at ISU. ​Kayla became part of the team in the summer of 2017. Her work focuses on the relationship between discharge and fine particulate organic carbon (FPOC). There are still many questions to be asked regarding the carbon cycle and how fluctuating hydrology will affect it. Her objective is to bridge a few of those gaps by correlating FPOC and discharge in the Reynolds Creek Critical Zone Observatory. David completed his PhD in Biology at Idaho State University in December 2017 examining climate and land-cover change disturbance effects on ecosystem carbon and nutrient partitioning. He received his Master’s degree in Soil Physics from the Soil and Crop Sciences Department at Colorado State University, working with an engineering group to ameliorate salinization of agricultural soils. His Bachelor’s degree in Biology at Colorado State University focused on plant and microbial ecology, with his senior thesis characterizing the distribution and phenology of one of Colorado’s rare endemic plant species. Davide is currently a Reynolds Creek CZO postdoc at the USDA ARS in Boise, Idaho.